This is called the “Bigger Smaller Magic Trick”. The reason for this will be explained later. 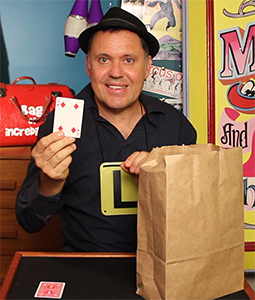 This magic trick is certain to play well to larger audiences. I used it one of my routines and it continually got big reactions from audiences of all ages; except young kids. Kids under the age of 10 don’t usually see that the “joke” is a bigger part than the magic trick itself of locating their chosen card. Their reactions are generally to call out and point out that it’s not a real card. If it is a family audience shouldn’t be too big of a problem though. The Jingle Bell Monte magic trick plays on the age old 3 Card Monte Gambling Game that is often seen being played on the streets in just about every city worldwide. 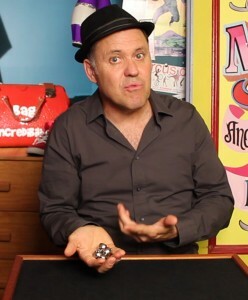 The gambling aspect has been removed from this particular magic trick and has been replaced with the fun element of locating the Jingle Bell.